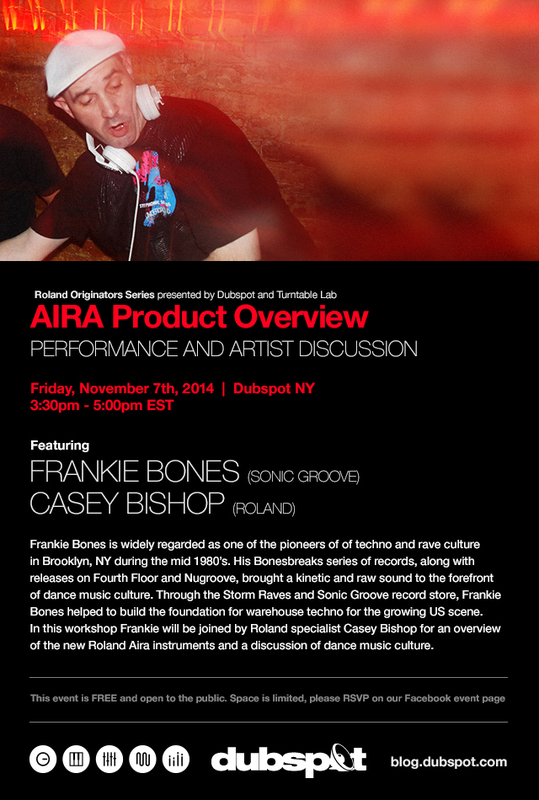 NY Techno legend Frankie Bones visits Dubspot 11/7 with Roland and Turntable Lab for an AIRA demonstration, performance, and Q&A. Frankie Bones is a techno and house innovator from New York City. He’s widely attributed with bringing rave culture to the United States after playing a hangar party in the UK in the late 80s. His “Storm Raves” in Brooklyn grew to massive attendance of over 5,000 people and played host to such names as Sven Vath, Richie Hawtin, Josh Wink and The Horrorist. Frankie is also accredited with creating the PLUR (Peace, Love, Unity, Respect) ideology that still permeates rave culture to this day. With his brother Adam X and Heather Heart, Frankie started Sonic Groove Records and a record store of the same name. The store closed in 2004 and was a mainstay of the New York house and techno community. The AIRA Crew hits the road this fall for a series of “AIRA House” events. These include a selection of special “Originators” events featuring the AIRA Crew and a local originator of a style or movement in electronic music. Partnering with various local venues and training academies we come together to listen and learn about both the history and current trends of electronic music production and performance. We’ll discuss what drove the pioneering spirit and experimental attitudes of trailblazing artists and how legendary electronic musical instruments like the TR-808, TR-909 and TB-303 shaped techno and house and found their way into the hands of the artists that made a real difference. We’ll look at Roland’s place in electronic music history through the eyes and ears of the artists and explore where it’s all heading with the next evolution of Roland electronic instruments. Not only will you have a chance to gets hands-on with Roland’s very latest gear for electronic music, but you’ll also have the chance to win a Roland TB-3 Touch Bassline, signed by the presenting Originator in your area! So save the date and come join us at this event. For more information, click here.